There is historical evidence supporting the notion that perennial horticulture played an important role in the economy and culture of Afghanistan for many centuries. As early as the 1958 the Nangarhar/Jalalabad Oasis was identified as the potential hub of the citrus industry in Afghanistan. More than four decades of war, political, social and economic instability added to several years of drought resulted in the destruction of large orchards and with them the livelihoods of thousands of rural households and the decimation of the citrus industry. The remaining productive capacity comprises predominantly small growers, with citrus orchards of less than 5 jerib each. Several initiatives were launched and implemented to re-establish the perennial horticultural industries in general and the citrus industry in particular. An unintended unfortunate consequence of the interventions by international donors and Non-Governmental Organisations was that the initiatives became extremely donor and project dependent with little ownership of the grass root level farmer/grower and the subsequent loss of orchards established during the last 12 years. A critical prerequisite and critical gateway to a sustainable industry is the availability of quality germ plasm coupled with the fruit producing tradition of the country and strong market incentives have the potential to reactivate the industry, turning it into a major economic development engine. The establishment of the National Collection and a successful certified sapling nursery industry received the highest focus during the immediate past 6 years. The focus is however shifting to the operating industry addressing the need of the grower at grass root level. The Support to the Development of Agriculture Private Sector: Perennial Horticulture ProjectStrategic Object 4 (HPS/SO4) aims to enhance the partnership of the Nangarhar DAIL and PHDC-JAL with NVDA, CPG and citrus producers of Nangarhar, Kunar, Laghman Provinces bringing together MAIL / DAIL and the private sector for the renaissance of the citrus industry in eastern Afghanistan. 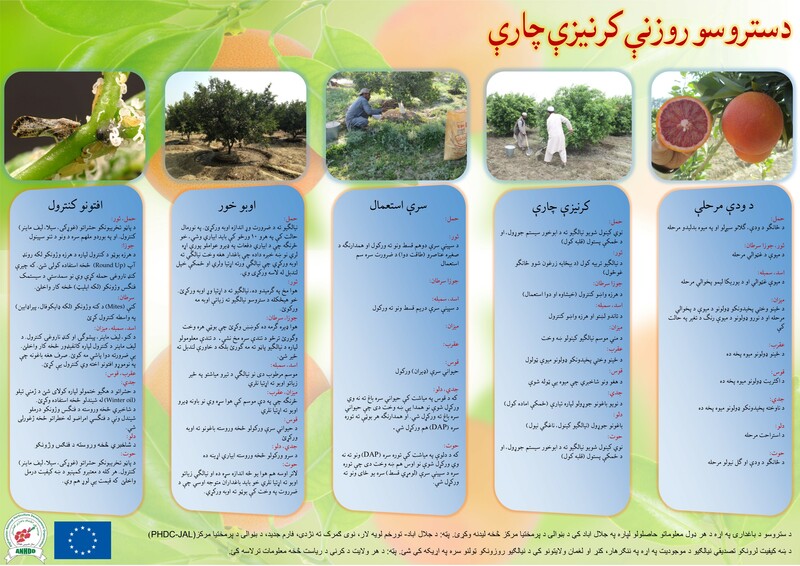 Here is the list of citrus varieties exists in National Collection of Jalalabad PHDC (Perennial Horticulture Development Center) in the year of 2015. Click here for watching visual training materials and video tutorials. For more information you can follow our dedicated citrus Facebook page here! Or you can visit the the Prennial Horticulture Development Center (PHDC)- Jalalabad which is located at:Farme Jadid Research Farm, Jalalabad Torkham Road, Nangarhar.